The libraries in this list house the state’s largest Alaskana collections. “Alaskana” refers to written works about Alaska, and materials related to the Circumpolar North as a whole. 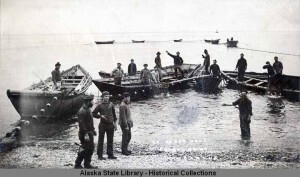 Hauling in a load of salmon in a double seine net, Karluk, Alaska, 1901. ASL-P277-008-064, Wickersham State Historic Sites Photograph Collection, Alaska State Library-Historical Collections.